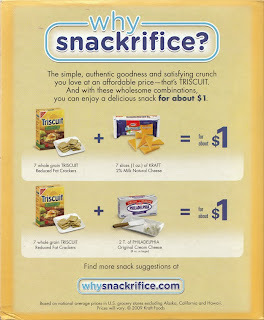 This was on the back of a box of Triscuits I recently bought. I now regret buying them. What marketing genius thought up this clever campaign? "Snackrifice"...give me a break. And the really sad thing about this is that the marketing weenies who came up with the promotion probably make a lot more money than I, as an educator, do. What does this say about our society's priorities? If 'sacrifice' is a Latin derivative originally meaning 'to make sacred', then does 'snackrifice' mean to make something amusingly and conveniently edible?